(C) Carson Dunlap, "The Illustrated Home"
The effects of air leakage are well documented in two early posts: High Energy Bills and Hot & Cold Rooms. Essentially, air will move through any hole where there is a driving force. In a house, it’s usually caused by the weather and the stack effect (the concept of heat rising while drawing in cooler air to replace escaping hot air through the roof. These drafts are real. The solution is to seal air leaks through holes in the floors, walls, and ceilings. The effects of duct leakage are also well documented in the earlier posts on High Energy Bills and Hot & Cold Rooms. Here, the real problem is uncomfortably hot or cold air can be drawn in through holes in the ductwork. Since the heating and cooling system is unable to keep up, the air blowing on us is uncomfortable. The solution is to seal the ductwork. Uninsulated and under-insulated walls cause air to move by convection. Warm indoor air comes in contact with the colder exterior walls, cooling in the process. The cool air falls to the floor, which draws warm air from the ceiling across the colder exterior wall. This process continues indefinitely until something changes. The change needed in this case is to warm up the wall. This is usually best done by adding insulation to the wall. Curtains could also be installed on the wall. However this option is probably less desirable and not nearly as effective. Our bodies radiate heat all the time. The sun radiates heat. When solar heat shines on us we feel warm because the photons strike our skin and we absorb the energy released. We don’t usually think about it, but when it’s cold and dark, we radiate heat right through a window. The sun radiates in, we radiate out. The part of our body exposed to the window is noticeably colder than the parts facing the floor, walls, and ceiling. And, it feels just like a draft! 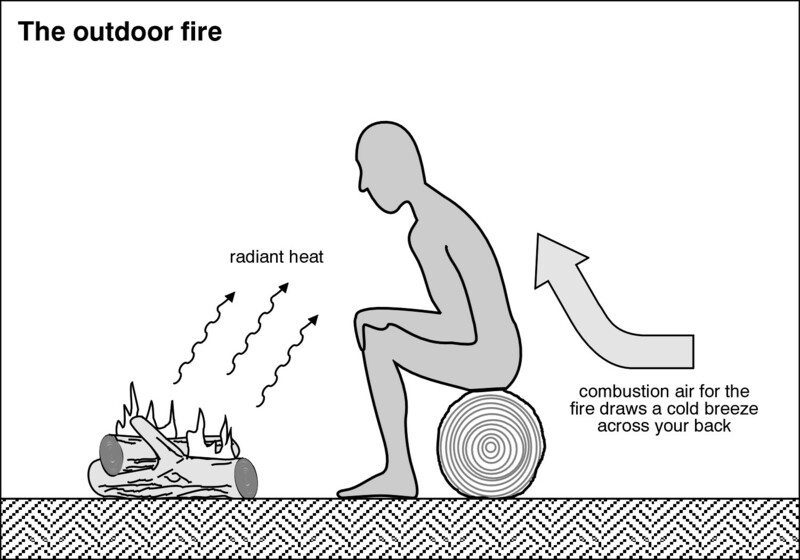 It may be easier to relate to a campfire, as a model. We know a campfire is warm, especially the parts of us facing the fire. However, on a cold night, the rest of our frame is cold. That part of our body is radiating heat into the night. The solution is to cover the windows, such as with curtains, shades, or blinds. Multiple panes of glass, especially those with low-e coatings tend to reflect radiant heat back into the building. In this case, window treatments are the best choice. Diagnosing and fixing drafty rooms can found on our website, especially in the categories of air leakage, duct leakage, insulation, and windows. An website for discussing body heat loss through windows was not found–yet! If you have one, let us know. They were either so technical that only physicists and hard-core mathematicians would appreciate them, or the were so week they were uninteresting. We’ll eventually get around to creating one. For now, we off Terry Jensen’s article, “Cold Windows“. He’s from DFW Green Building and Renewable Energy.